A new recording of Bach's harpsichord transcriptions of concertos by Italian contemporaries hardly merits the same excitement as a recording of, say, the Goldbergs. These transcriptions are available in a fair number of recordings, but in terms of popularity they are not in the same league as Bach's most famous keyboard works. The reason could be that they are 'merely' transcriptions of pieces for other scorings. That in itself can't be a reason that they are treated with some disdain. After all, Bach regularly transcribed his own compositions for other scorings. Could it be that many keyboard players still think that Vivaldi composed the same concerto 600 times, as a famous 20th-century composer once stated? They should know better now that so many of Vivaldi's compositions are available in excellent interpretations which make their individuality clear. Bach certainly had a high opinion of them. He made these transcriptions when he worked in Weimar. At that stage of his career he was much absorbed in study of the Italian concerto, and especially those by Vivaldi whose music he considered a model for his own instrumental works. In his violin and oboe concertos, some of which he later transcribed as harpsichord concertos, he embraced the sequence of three movements - fast, slow, fast - which was one of the features of Vivaldi's concertos. These transcriptions bear witness to his study of the Italian concerto. Copying music was one of the favourite ways of becoming acquainted with the newest music. Earlier he had copied French and German music with the same purpose. 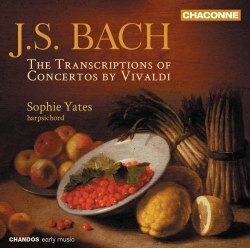 In her liner-notes Sophie Yates speculates that Bach also may have played them in his own concerts. That can't be ruled out, although we don't know that much about performances by Bach. As a Konzertmeister in Weimar he certainly performed Italian music with the members of his chapel, but whether he himself performed music for harpsichord solo is impossible to say. It seems certain that they were not written for amateurs: they were never printed, and they were likely too technically demanding for non-professional players anyway. Whatever the reason for their composition may have been, Bach has provided modern performers with some admirable music to play. One of the virtues of these pieces is that they are much more than 'mere' transcriptions: these are idiomatic harpsichord works and build a link between the instrumental music of Bach and his contemporaries and the music for keyboard. His own Italian Concerto - included in the second part of the Clavier-Übung - is not unlike these transcriptions and could be transcribed as a concerto for an ensemble of strings. That has been done, for instance, by Andrew Parrott who recorded it in such a transcription with his Taverner Players. In 2012 I reviewed a complete recording of these concertos by Elizabeth Farr. Apart from the choice of the harpsichord, including a 16' stop, I criticised Ms Farr's tempi which I characterised as "middle of the road". Sophie Yates's tempi are quite different: most fast movements are considerably faster than Ms Farr's, and in the slow movements Ms Yates takes much more time. As a result the contrasts and dramatic character of these pieces come off much better. I also criticised Ms Farr's constant variation of tempo within movements. As I wrote then I am in favour of a differentiation in tempo, but I felt that she was indulging in excessive exaggeration. Here we get almost the opposite: especially in the fast movements, Sophie Yates prefers a very strict tempo and rhythm, and there is hardly any rubato. The truth lies somewhere in the middle: there is certainly room for variation in tempo, but only for dramatic reasons, not as a kind of mannerism as in Elizabeth Farr's recording. If I have to make a choice I prefer Ms Yates's interpretation as it does more justice to the theatrical character of Vivaldi's concertos. There is no lack of expression in the slow movements, even though now and then a little more freedom would have been appropriate. Sophie Yates plays a copy of a very fine French harpsichord. It lacks a 16' stop, but her performance shows that such a device is not essential.